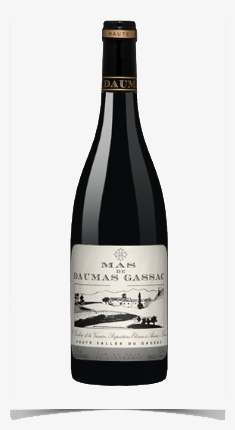 Mas de Daumas Gassac has been owned by the Guibert family since the 1970’s. When glove maker Aimé Guibert and his wife moved from busy Paris to sleepy Languedoc, they had no intention of growing grapes until they were visited by legendary enologist Emile Peynaud. (An enologist is a wine maker who specializes in the chemistry of the trade. Now deceased, Mr. Peynaud was instrumental in all of France for setting winemaking standards and modernizing the industry.) Mr. Peynaud described the land of Mas de Daumas Gassac to be not only ideal for everyday wine, but capable of making excellent quality wines of intensity, power and ageability. Since Mas de Daumas Gassac’s first vintage in 1978, this winery has led the Languedoc in quality organic winemaking, and had done much to put the sun-drenched and desert-like region on the wine map of France. The grapes for this wine are organically farmed in the Gassac valley, where hot days are cooled by the Gassac River and nearby mountains and sea. After winemaking the wine remains unfiltered and aged in only 10% new oak barrels for 13-16 months. – decant 3-4 hours before serving.